Natural Sunscreen SPF 50+ Spray is formulated with Rosemary Extract, Grape Seed Oil and Olive Oil to naturally and effectively protect the skin from harmful sun rays. Easily absorbing and free of harsh chemicals such as parabens, sulfates, and dyes, this milky spray offers broad spectrum protection and is gentle enough for daily use. Enriched with Squalane to promote skin health. Natural Sunscreen SPF 30+ Spray is formulated with Jojoba Seed Oil, Shea Butter, and Safflower Seed Oil to naturally and effectively protect the skin from harmful sun rays. Free of harsh chemicals such as parabens, sulfates, and dyes, this milky spray offers broad spectrum protection and is gentle enough for daily use. Enriched with Squalane to promote skin health. Natural Sunscreen SPF 25+ Lotion is formulated with Jojoba Seed Oil, Shea Butter, and Safflower Seed Oil to naturally and effectively protect the skin from harmful sun rays. Free of harsh chemicals such as parabens, sulfates, and dyes, this milky lotion offers broad spectrum protection and is gentle enough for daily use. Enriched with Squalane to promote skin health. Sunscreen Moisturizer SPF-15 is an oil-free sunscreen designed to provide sun protection, while maintaining moisturized and balanced skin. Great for those with oily to problematic skin. 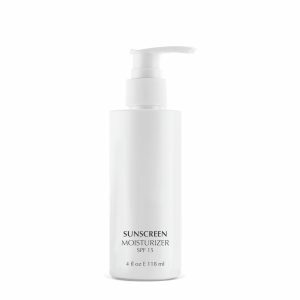 Sunscreen Moisturizer SPF-25 helps provide maximum sun protection, while maintaining hydrated and balanced skin. Great for all skin types!.